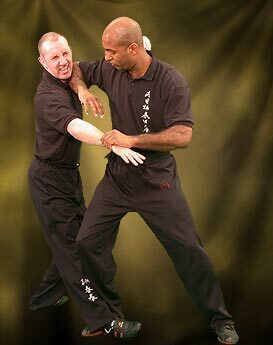 In Wing Chun when we block we simultaneously attack. This speed and lack of hesitation can make whatever strike you're doing much more devastating. Instead of "trading blows" you fire back without it being expected. As soon as your opponent throws a punch, both arms go up. One arm stops his attack, the other counters. This strategy can also be used with kicks. Comment from Rob@WingChunLife: No comment! I agree 100%. I agree with most of the above Wing Chun strikes, blocks, and their effectiveness. These are the techniques I prefer. Chain punches(3-5) followed by palm strike. Chop followed by side kick to the knee either together, after another or used as a single attack. When close combat block the punch then (6 chain punches, left chop, right palm, elbow then hook. *From the Joseph Lee Wing Chun Assocation. 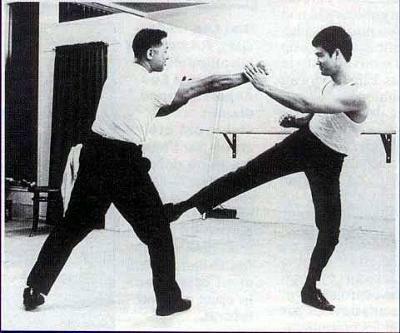 Grandmaster Ip man to Lee Shing then passed on to Joseph lee. Check out Wing Chun schools, or list yours here. Wing Chun Strikes are Weak...and DEVASTATING! The fist is our weakest weapon. Our power comes from the earth by way of body structure and hei. Hei energy and physics make our strikes unique. Our strikes are also able to deflect oncoming force by keeping the elbow down. The elbow does not move. We can strike with much power from any distance, even 1 inch away, or touching the target by alining our body structure and snapping the wrist downward, sending our body weight and power from the ground right into our target. A one "inch punch" done into the air with no target to contact will send the power up and back down to the ground so rapidly that it will cause a violent shake inside when done correctly. This is why 137 lbs Bruce Lee was able to "shove" much larger and heavier men clear out of his way with this powerful punch. Two hands deliver twice as much power! (Remember, it is not a shove or push, it must have that pop or snap which makes it a true punch). Wing Chun gung fu is very scientific and simple, "mastering" the applications can take anywhere from several months to many years, depending on your understanding and ability. At the same time, learning never ceases and with each new skill mastered comes great rewards.